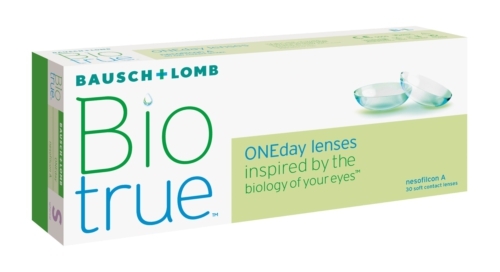 Biotrue®ONEday the first daily disposable lens inspired by the biology of your eye. The bio-inspired lenses contain 78 per cent water, the same water content as the cornea, while delivering virtually the same oxygen level as the open eye. The outer surface of the lens is designed to mimic the lipid layer of tear film, which prevents dehydration of the lens, so maintaining consistent optics and delivering the oxygen level the open eye needs to maintain healthy, white eyes. Biotrue™ ONEday lenses provide the maximum amount of moisture of any daily disposable lens on the market today, even after 16 hours of wear.